We have gained expertise in providing remarkable Solutions and Services for Waterproofing, Repair and Retrofitting of all kinds of structures. These services are provided by a team of experienced professionals, after understanding the clients' problems and their expectations. Due to having qualities like reliability, cost-effectiveness and customer oriented policies, our services are widely appreciated by the respectable clients, across the nation. 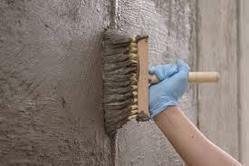 We Provide Crystalline Waterproofing Services for Basements, UG Tanks and Other Critical Areas to do Waterproofing From Negative Side. Our range of APP or SBS Membrane Waterproofing Service is manufactured from rich bitumen & select polymers blended together to obtain excellent heat resistance & cold temperature flexibility. The polymer modified bitumen is then coated on to a dimensionally stable non-woven polyester/ fibre glass carrier to obtain high tensile strength, tear & puncture resistance. Our membranes are available in both SBS & APP modified versions. As per the variegated requirements of our clients, we are offering the best-in-class Repair and Waterproofing Services which is leak proof in nature. The service is rendered by our well-versed professionals in hassle-free manner using innovative technology in observance with the predefined market norms. Our offered service is widely preferable in construction, residential and other allied place for preventing from seepage or leakage of water. 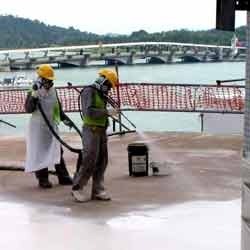 Looking for Waterproofing Services ?